I’d arrived at La Varenne in August and the first few months passed quickly. Soon that first Christmas rolled around and I imposed on some friends to spend a couple of days with them. Anne-Marie and Jo I knew well from my time in Dijon a few years earlier, she had been the coordinator for the six of us from University of Puget Sound who were on the inaugural year of the school’s French study-abroad program. Their kids were grown, most with families of their own by then, establishing their new holiday traditions. So it was to be me, Anne-Marie and Jo (may dear, wonderful Jo rest in peace) at their home in the southwest of France, joined for Christmas Eve dinner by their Belgian friend Annie who lived nearby. 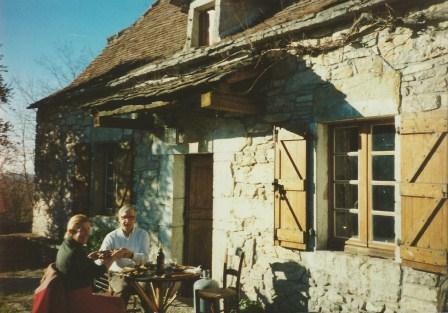 I had been to that home many times since we first took a weekend trip from our Dijon studies to explore this rough and rustic part of France. The original main house dates to mid/late 18th century. While it does have electricity and heat, and they did put in a small, simple modern bathroom at some point, if you squinted in the kitchen and main living area, could believe you’d stepped back in time a century or so. A large flat stone sink in the kitchen runs with just cold water, and dishes are stacked on open wood shelves. (There’s a modern kitchen in a newer building on the property.) A big open-hearth fireplace dominates the living room, with low sturdy chairs, an animal skin rug. I can’t tell you how many happy evenings have been spent sitting there, staring into the crackling fire after a generous meal, sipping the last of the local Cahors wine, talking, imagining, reminiscing. That very first college-era visit to this evocative place, we arrived on a wintry evening, cold and pitch black outside. It was almost like a fairy tale opening that door and feeling in another world, the warm glow of light, rough stone, exposed wood beams, the roaring fire. Suspended inside the chimney on a large hook was a big, black, worn cauldron in which supper was simmering (a rich stew of some kind, details are escaping me .) It was a most delicious and inspiring introduction to a home that has been the source of some of my most cherished memories of being in France. Christmas Day in the southwest of France, lunch on the patio. Some four years later, my path leads me again to France’s southwest to celebrate my first Christmas away from home. I arrived Christmas Eve and though Anne-Marie had done much of the provisioning for dinner, we did some final errands that day. Sunny and warm, an early afternoon walk took us to the home of the mayor of their tiny village who — as it so happens — raised geese and made foie gras. (reason #456 to love France: mayors who produce foie gras!) So we picked up some pure and simple pâté, as well as a fresh lobe for the following day. To the market for some earthy, dark, heavily crusted country bread, pain levain and some lettuce for the salad. Dessert was to be a simple, beautiful platter of exotic fruits for us to pick from. A fire was made in the fireplace, blazing for a time, then down to rich embers. Dinner was again suspended from that same hook I’d seen holding that cauldron earlier. This time it was gigot à la ficelle, “leg of lamb on a string,” spinning, spinning, spinning…. The meat had been rubbed simply with salt and pepper, a piece of foil perched below to catch drippings which were occasionally spooned back up over the leg. The heavy string, tied securely around the bone end of the meat and the hook, had been slowly twisted until taut, then gently released to begin the magic of physics, spinning until unwound, its momentum carrying through to tightly wind up in the opposite direction. When the momentum peters out and meets resistance, the string unwinds again. One direction, then the next, on and on for a couple of hours. Utterly mesmerizing. And wildly tantalizing, knowing that this particular experiment in physics is producing luscious, slow-cooked meat for supper. Potatoes were wrapped in foil and plopped carefully into embers along the side to roast. We cut thick slices of that hearty bread, pierced them onto long prongs and toasted the bread over the coals. The smokey toast was topped with generous smears of the mayor’s foie gras pâté, I’m sure no 3-star foie gras dish could compare. Sipping wine, watching our dinner cook, basking in the warmth of the fire, enjoying the absolute peace of the place. Heavenly, magical, reviving, celebratory. It might have been my first Christmas away from home. But I was home, nonetheless. With friends, comfortable, warm, sustained. It’s a meal I’ve reflected on many times over the years. That and countless other meals I’ve had with Anne-Marie have had a big impact on my love of food, my approach to cooking. Yes, I studied cuisine at one of the top cooking schools in France, I’m well-versed in the finer points of haute cuisine, conversant in classic technique, able to produce elaborate gateaux or complexly-crafted terrines. And love doing so now and then. I learned a great deal from the amazing chefs, lessons that consistently inform how I cook. But I learned, too, quite a lot watching Anne-Marie cook. She produces marvelous, flavorful, wildly satisfying meals with the least extraneous effort of anyone I know. A couple trout, a skillet, some butter, a handful of hazelnuts, a few parsley leaves. Small potatoes, lightly scrubbed, some oil, a dash of salt. Bright crisp lettuce, a splash of oil, some vinegar, a nub of mustard. No effort at all, it seems. The most natural gestures in the world, to watch her in the kitchen. The essence of home-style French cooking to me. My inspiration. We’d eaten what could qualify as a simple–in its “un-complex” context–meal that Christmas Eve. But it provided substance, satisfaction, pleasure that equals the grandest of meals. As did our Christmas Day lunch the following day, thick slices of foie gras quickly pan-seared. Shortly before serving, green grapes added to the pan to toss for a few moments, brisk bright flavor to complement the rich liver. Oh…..so……amazingly…….good. My wish for you is a holiday season that’s generous with simple but substantial moments. May the last couple weeks of 2012 find you cozy and warm, surrounded by family and friends and delicious things. And here’s to a phenomenal year of 2013 for all of us. what beautiful memories with beautiful people, with warm and happy days ahead. Remember to play!